We really appreciate you joining us at The Bestseller Experiment. 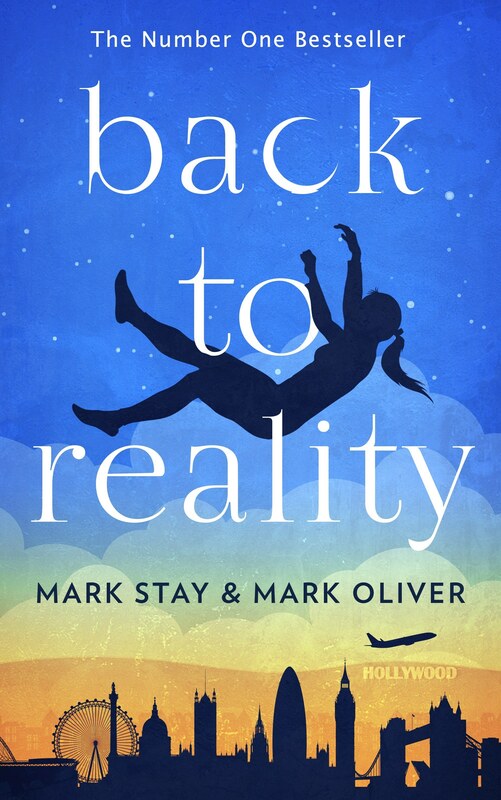 It started off as a crazy idea but we have always said that if one listener manages to write a bestseller or discovers a new-found love for writing, it will have been worthwhile. People ask how they can help spread the word so we put this page together so you can help spread the love. What's more, you can build your marketing skills for when your bestseller is ready! 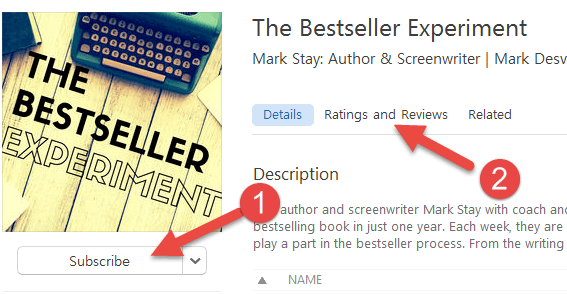 Subscribe, Rate and Review on iTunes (see screenshots below). Share the podcast on your social media with a personal recommendation. Know a writer or someone who would love to write a book? Drop them a message or email. Part of a writing group? Post a link on the group's Facebook page. Email / Tweet / Share us with the editor of your favourite content site. One listener, Bethany Swafford, told Buzzfeed about us which resulted in a feature called "Podcasts You Need to Listen to in 2018." Surprise us with something wonderful, bizarre, or outrageous! See below for suggestions, including tweeting your favourite author and telling them "You should be on this show!" We would massively appreciate if you could following the steps below. This would make a HUGE different to helping spread the word, and when we next see you, we'll share our last chocolate Hob-Nob. There are 4 steps to this. There a little drop down arrow by Subscribe in iTunes where you can do this for Facebook and Twitter. The "Tell a Friend" might come in handy for people not on your social network who love to write. Know a writer or someone who has a dream of writing a book? Send them an email with a link to your favourite episode, or send them to the homepage where they can watch the Intro Video. Getting featured in a major publication is HUGE for any podcast or book. Before you start marketing your own book, here's a chance to practice. Find an article on your favourite news site - the BBC, Guardian, Huffington Post, Buzzfeed. Find the journalist name and email (usually at the top or bottom or the article) and drop them a personal email, thanking them for their article and tell them about the podcast and how it has helped you. TOP TIP 1: No email? Google their name, the publication and the word 'email' or 'contact' e.g. TOP TIP 2: Still no luck? - Copy the web site address without the www. - Add an @ symbol at the start. If we get featured you'll certainly see your name in lights! It's the end of the week, so it is time to do something outrageous! Here are some ideas... Let us know of any others you dream up. "You need to be on this The Bestseller Experiment!" 3) Hold a Bestseller Experiment party! Requires two or more friends. Tea / coffee or something stronger. You each bring your favourite book and try to convince the others in under ten minutes why they MUST read it. Then play them your favourite episode of the podcast. Sit around stroking imaginary beards and then talk about the book you'd write to become a Bestselling author. 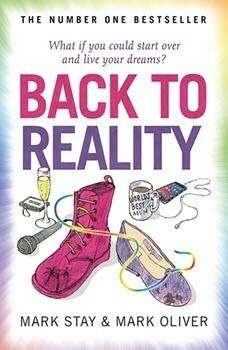 4) Get your Book Club to read "Back to Reality". Drop us an email once you have read it. If you are the first club, we might invite your Book Club on a special show to tell us what you thought! 5) Stuck for ideas...? Why not support us on Patreon, hear your name dropped on our show, get loads of exclusive and bonus content AND help us cover the running costs of the podcast! Fandabbydozy! By the way... did we mention you are a SUPERSTAR!! Thank you.